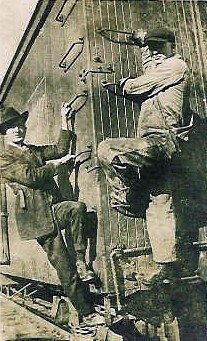 Unknown Men on the railroad, possibly working on the railroad. I am so sorry to not have the name available. But there is a Tredway that invented and built the first cargo train. I am the Great granddaughter of Marion Francis Tredway and granddaughter of Minnie Tredway Moore.